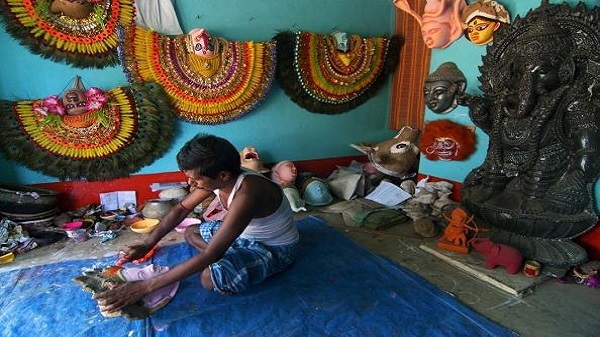 The tribal villages nestled in the lush green Ayodhya Hills have a very peculiar way of life. They are home to Santhals, one of the largest tribes in India. They are one of the few tribes who have retained their original language to present day. They live only on subsistence farming, and do not practice any other economic activity. 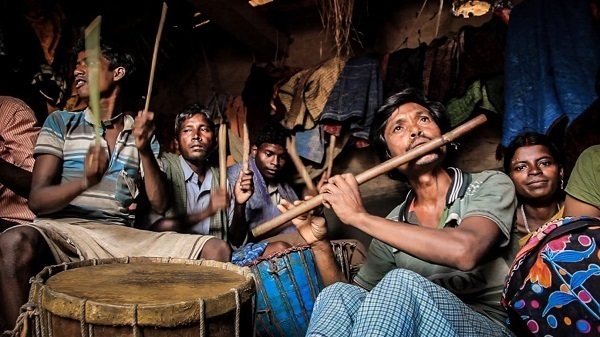 Their usual day starts with playing music, and they do it all day long! They celebrate every day of their life, dancing, and playing music. The code is - men play the instruments, women sing. Chickan and Zari work involves women doing extremely delicate needlework where it often takes many hours to finish one design. They create patterns and designs on sarees of various colors of silk and each design contains hundreds of stitches and beads. “Chikan” is a traditional style of embroidery and “zari” is a specific type of thread that is interwoven with gold, silver or some other metallic material to give the thread a shimmery and luxurious sheen. 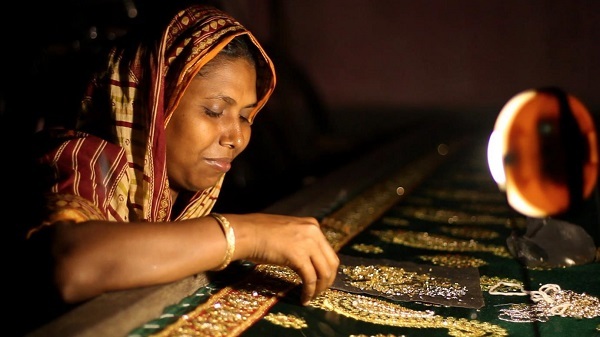 Dakshin Barasat, a quiet and serene village in rural West Bengal, is home to a large community of women who practice zari and chickan work as a profession and it has helped umpteen families find a way out of poverty. Ritwika Roy hails from Pukurpara, a small village peppered with beautiful waterfalls. 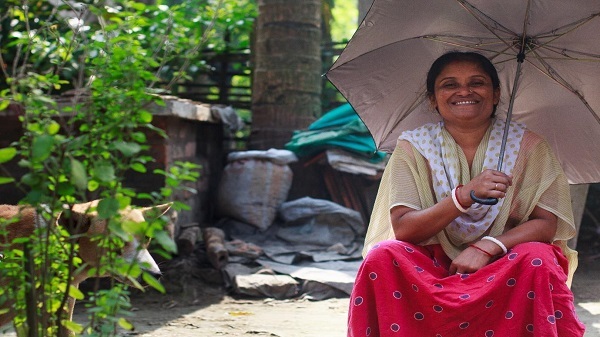 She has a very unusual job - she makes umbrellas from scratch, at her home! It’s almost like an art form. Getting all the pieces together and building an umbrella at home is certainly an arduous task. She has done this for the last 15 years! And that’s not it - she takes them to the market herself, sets up a small shop on the weekends and is pretty popular in the village. She’s not the only one, there’s a large group of women who produce umbrellas from home just like her. 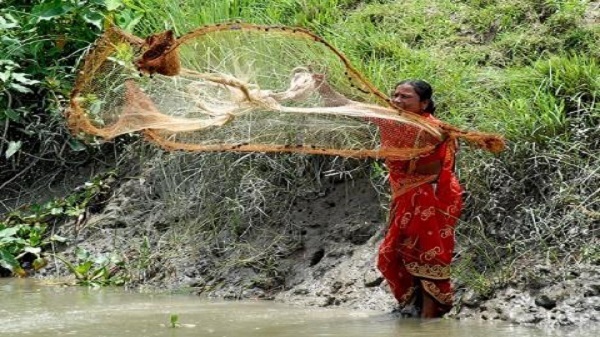 Fishing is a way of life in the Basirhat village of West Bengal, which is located on the bank of Ichamati River. There are families that have been fishermen for generations. Their day begins at dawn when it’s still chilly and dark. They've now adopted modern techniques of fishing i.e. fish cultivation. It involves artificial breeding, raising fish commercially in enclosures, and propagation of fishes. Fish cultivators of Basirhat have perfected the art of fish cultivation and have taken it to their ponds. It’s a major part of the village’s economy now! Meet Champa, she lives in small village overlooking endless paddy fields, Dhoopguri. She makes gauze bandages at home using an indigenous weaving machine. The process requires a very high degree of coordination among the moving parts and she manages to do this at home. She even packs them herself, supplies them at medical stores, and also sells them in the market. Definitely a rockstar! There’s a huge community of bandage weavers in her village, the streets are filled with rattle from weaving machines. And we thought only large pharmaceutical giants produce bandages! Chhau is a popular folk dance form practiced in Purulia district of West Bengal, an integral part of this dance form is the mask that dancers use. These masks are prepared by skilled artisans with the use of paper pulp and clay. Several layers of soft paper pulp mixed with the gum from mulberry plants are pasted on the clay models of masks after being dried in the sun. Later the masks are wrapped in a clay-soaked muslin cloth for a smooth texture and polished with a wooden spatula. At last the masks are painted and decorated according to the character (for example, bright yellow and orange are used for gods and goddesses while deep green and black are preferred for demons). The attention to detail is what surprises you the most! Ever wondered where all the newspaper bags at these mom-n-pop stores come from? 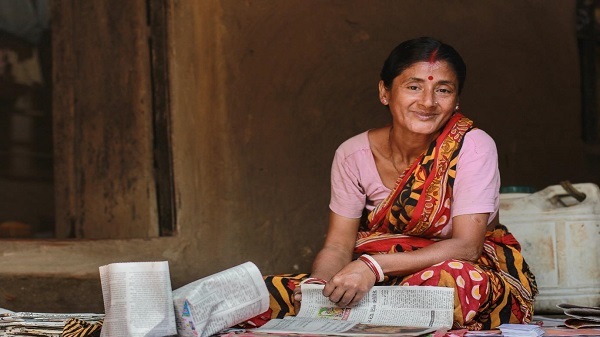 Meet Purnima Mondol from Mayureshwar, a quiet village away from the hustle and bustle of cities. She’s been making paper bags at home for 25 years now. She starts early in the morning and works late till night. The speed at which her hands move while working is just unbelievable, and a treat to watch! There’s an entire community of women who make paper bags. Inspired by these heroes from the rural India? You can become a part of their journey too. Click here to support their endeavors.